High-intensity interval training workouts are radically different from the traditional training programs, which focus on smooth and controlled motion over a long duration of time. In HIIT workouts, one must perform a range of motions at a rapid pace in a short duration of time. Studies have pointed out that HIIT workouts are beneficial over traditional strength training and aerobic exercises when it comes to calorie-burn and getting in shape. Additionally, due to the volatile nature of the training program, it activates a host of muscles both in the upper and the lower body in a single workout routine. Nevertheless, remember that the HIIT workouts require proper warm-up exercises like the traditional training programs to activate muscles and improve blood circulation. Furthermore, people looking to burn fat and get in shape must focus on having a healthy diet that is rich in protein while containing reduced quantities of fat. Let us dive in deeper and look closer at the five HIIT workouts in include weights to burn the fat at a faster pace. The kettlebell swing is a wonderful exercise for burning calories at an accelerated pace. Additionally, this exercise is very effective in toning a host of muscles in the upper body including the shoulders, biceps, triceps and the abdominal muscles. Also, read Explosive HIIT Workout Plan To Burn Fat & Reduce Weight. Step 1: Stand straight with your feet positioned shoulder-width apart and secure the kettlebell with both the arms using a pronated grip. Slightly bend your knees and move the kettlebell between your feet. Step 2: Swing the kettlebell forward by bending your hips forward and straightening your torso. Continue this motion until the kettlebell is just above shoulder-height. Ensure that the arms are fully extended while performing the swinging motion. Step 3: Pause for a second and return to the initial position. Perform the exercise for the recommended number of times. Important tips: Ensure that you follow proper form while performing this exercise as an improper form could lead to a serious rotator cuff injury. 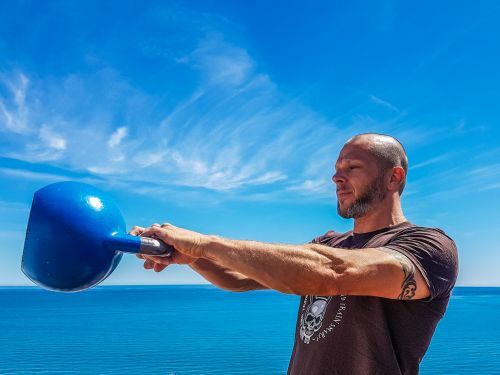 Experienced trainers could perform one-arm kettlebell swings for a more targeted workout experience.